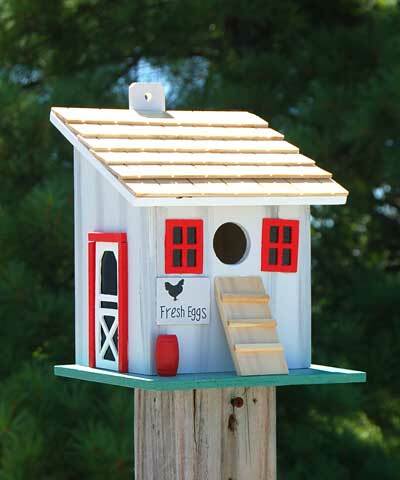 Showcase your love of different bird types with the Home Bazaar Small Chicken Coop Bird House. The all wood construction, muted color scheme, and familiar details create a rustic shelter, adding a farm motif to your garden easily. The weathered white, painted body forms a charming roost, topped by a generous, shingled roof. Faux windows and doors around the unit offer realism, while their red frames bring exciting color to the area. A sign reading "Fresh Eggs" with a chicken silhouette, as well as a poultry ramp beneath the 1.25" diameter entry hole, complete the coop theme. The shelter rests on a generous, green platform which evokes grass, and this structure provides plenty of room for a chickadee or wren to nest. The unpainted interior of the unit creates a safe haven for birds, and two drainage holes on the base help the nest remain dry. A door on the back of the home swings upward for nest checks, and a hanging tab allows you to display the piece on a post or wall easily. Crafted from wood, this abode will withstand use all season, and its bold colors add charm to your backyard. Bring a love of livestock to your bird garden using this Small Chicken Coop Bird House. Note: Climate and the elements will weather this house and change its appearance over time; however, weathering will add to the home's natural charm without compromising its function. Should you want to preserve the finish (paint) of this item, you should cover it with several layers of a water-based sealant. You should expect that once left outside, the home will weather and require refinishing. Erva Pole Mounted Squirrel Baffle, Black, 8" dia.